The other day as I was grocery shopping, and I noticed blueberries were on sale. They looked delicious, and I suddenly needed to make something blueberry related. Pre-heat oven to 375. In a pie plate or 8x8 pan, layer blueberries, and sprinkle granulated sugar. Combine the rest of the ingredients in a bowl until the batter is thick & chunky. Sprinkle evenly over the blueberries and let is cook for 30-45 minutes or until mixture is bubbly. Serve warm with ice cream! This looks delicious! I like the idea of walnuts in this recipe, I never would have thought of that!! Oh and congratulations on your pregnancy!! Exciting!!! YUM! We've definitely been in a blueberry anything kick lately. The addition of the walnuts to your crisp sounds delicious! Might have to try that next time! 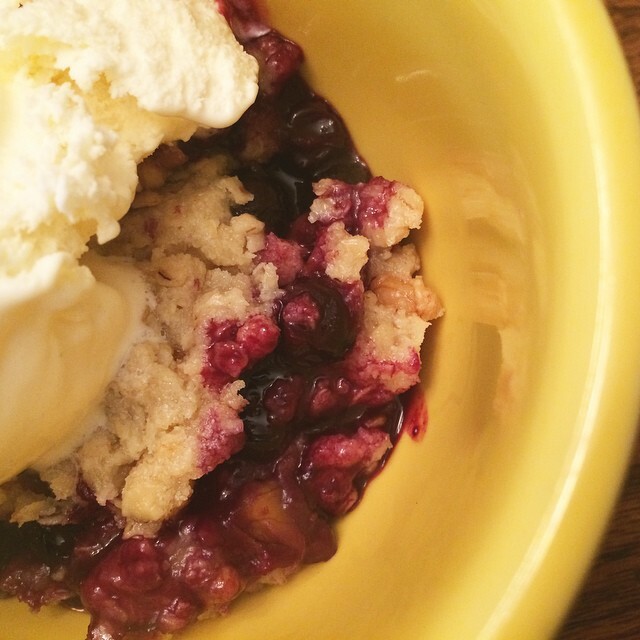 Pinned - I've got blueberries to get rid of so this is perfect! Sounds delicious! And we sure love blueberries here :-) Have a lovely evening. 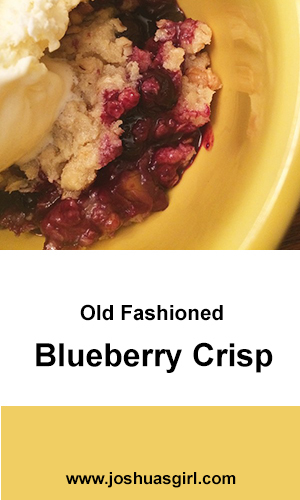 I don't think I have ever had blueberry crisp. It sounds great. We have a u-pick blueberry farm nearby and their blueberries are fabulous right now. I know what I'm baking next! Good morning! I just wanted to let you know that this post will be featured at Roses of Inspiration later this afternoon :) Thanks for sharing at the party last week! Hugs! Looks scrumptious! Butter, Walnuts, Blueberries - some of my very favorite ingredients! I've got to make this! Thanks for the recipe. Saw it on Roses of Inspiration.